Chapterhouse: Dune is a 1985 science fiction novel by Frank Herbert, the last in his Dune series of six novels. It rose to #2 on The New York Times Best Seller list. A direct follow-up to Heretics of Dune, the novel chronicles the continued struggles of the Bene Gesserit Sisterhood against the violent Honored Matres, who are succeeding in their bid to seize control of the universe and destroy the factions and planets that oppose them. Chapterhouse: Dune ends with a cliffhanger, and Herbert's subsequent death in 1986 left some overarching plotlines of the series unresolved. Two decades later, Herbert's son Brian Herbert, along with Kevin J. Anderson, published two sequels – Hunters of Dune (2006) and Sandworms of Dune (2007) – based in part on notes left behind by Frank Herbert for what he referred to as Dune 7, his own planned seventh novel in the Dune series. The situation is desperate for the Bene Gesserit as they find themselves the targets of the Honored Matres, whose conquest of the Old Empire is almost complete. The Matres are seeking to assimilate the technology and developed methods of the Bene Gesserit and exterminate the Sisterhood itself. Now in command of the Bene Gesserit, Mother Superior Darwi Odrade continues to develop her drastic, secret plan to overcome the Honored Matres. The Bene Gesserit are also terraforming the planet Chapterhouse to accommodate the all-important sandworms, whose native planet Dune had been destroyed by the Matres. Sheeana, in charge of the project, expects sandworms to appear soon. The Honored Matres have also destroyed the entire Bene Tleilax civilization, with Tleilaxu Master Scytale the only one of his kind left alive. In Bene Gesserit captivity, Scytale possesses the Tleilaxu secret of ghola production, which he has reluctantly traded for the Sisterhood's protection. The first ghola produced is that of their recently deceased military genius, Miles Teg. The Bene Gesserit have two other prisoners on Chapterhouse: the latest Duncan Idaho ghola, and former Honored Matre Murbella, whom they have accepted as a novice despite their suspicion that she intends to escape back to the Honored Matres. Lampadas, a center for Bene Gesserit education, has been destroyed by the Honored Matres. The planet's Chancellor, Reverend Mother Lucilla, manages to escape carrying the shared-minds of millions of Reverend Mothers. Lucilla is forced to land on Gammu where she seeks refuge with an underground group of Jews. The Rabbi gives Lucilla sanctuary, but to save his organization he must deliver her to the Matres. Before doing so, he reveals Rebecca, a "wild" Reverend Mother who has gained her Other Memory without Bene Gesserit training. Lucilla shares minds with Rebecca, who promises to take the memories of Lampadas safely back to the Sisterhood. Lucilla is then "betrayed", and taken before the Great Honored Matre Dama, who tries to persuade her to join the Honored Matres, preserving her life in exchange for Bene Gesserit secrets. Lucilla refuses, and Dama ultimately kills her. Back on Chapterhouse, Odrade confronts Duncan and forces him to admit that he is a Mentat, proving that he retains the memories of his many ghola lives. He does not reveal his mysterious visions of two people. Meanwhile, Murbella collapses under the pressure of Bene Gesserit training, giving in to "word weapons" that the Bene Gesserit had planted to undermine her earlier Honored Matre identity. Murbella realizes that she wants to be Bene Gesserit. Odrade believes that the Bene Gesserit made a mistake in fearing emotion, and that in order to evolve, the Bene Gesserit must learn to accept emotions. Odrade permits Duncan to watch Murbella undergo the spice agony, making him the first man ever to do so. Murbella survives the ordeal and becomes a Reverend Mother. Odrade then confronts Sheeana, discovering that Duncan and Sheeana have been allied together for some time. Sheeana does not reveal that they have been considering the option of reawakening Teg's memory through Imprinting, nor does Odrade discover that Sheeana has the keys to Duncan's no-ship prison. Odrade continues molding Scytale, with Sheeana showing him a baby sandworm, the Bene Gesserit's own long term supply of spice, and destroying Scytale's main bargaining card. Finally, Teg is awakened by Sheeana using imprinting techniques. Odrade appoints him again as Bashar of the military forces of the Sisterhood for the assault on the Honored Matres. Odrade next calls a meeting of all the Bene Gesserit, announcing her plan to attack the Honored Matres. She tells them that this attack will be led by Teg. She also announces candidates to succeed her as Mother Superior; she will share her memories with Murbella and Sheeana before she leaves. Odrade then goes to meet the Great Honored Matre. Under cover of Odrade's diplomacy, the Bene Gesserit forces under Teg attack Gammu with tremendous force. Teg uses his secret ability to see no-ships to secure control of the system. Survivors of the attack flee to Junction, and Teg follows them there and carries all with him. Victory for the Bene Gesserit seems inevitable. In the midst of this battle, the Jews (including Rebecca with her precious memories) take refuge with the Bene Gesserit fleet. Logno — chief advisor to Dama — assassinates Dama with poison and assumes control of the Honored Matres. Her first act surprises Odrade greatly. Too late, Odrade and Teg realize they have fallen into a trap, and the Honored Matres use a mysterious weapon to turn defeat into victory, as well as capturing Odrade. Murbella saves as much of the Bene Gesserit force as she can and they begin to withdraw to Chapterhouse. Odrade, however, had planned for the possible failure of the Bene Gesserit attack and left Murbella instructions for a last desperate gamble. Murbella pilots a small craft down to the surface, announcing herself as an Honored Matre who, in the confusion, has managed to escape the Bene Gesserit with all their secrets. She arrives on the planet and is taken to the Great Honored Matre. Unable to control her anger, Logno attacks but is killed by Murbella. Awed by her physical prowess, the remaining Honored Matres are forced to accept her as their new leader. Odrade is also killed in the melee and Murbella shares with Odrade to absorb her newest memories, as they had already shared prior to the battle. Murbella's ascension to leadership is not accepted as victory by all the Bene Gesserit. Some flee Chapterhouse, notably Sheeana, who has a vision of her own, and arranges to have some of the new worms that have emerged in the Chapterhouse desert brought aboard the no-ship. Sheeana is joined by Duncan. The two escape in the giant no-ship, with Scytale, Teg and the Jews. Murbella recognizes their plan at the last minute, but is powerless to stop them. Watching this escape with interest are Daniel and Marty, the observers of whom Duncan had been having visions. The story ends on a cliffhanger with several questions left unanswered regarding the merging of the Honored Matres and Bene Gesserit, the fates of those on the escaped no-ship (including the role of Scytale, the development of Idaho and Teg, and the role of the Jews), the identity of the god-like characters in the book's final chapter and the ultimate mystery of what chased the Honored Matres back into the Old Empire. Chapterhouse: Dune debuted at #5 and rose to #2 on The New York Times Best Seller list. Gerald Jonas of The New York Times noted that "Against all odds, the universe of Dune keeps getting richer in texture, more challenging in its moral dilemmas." 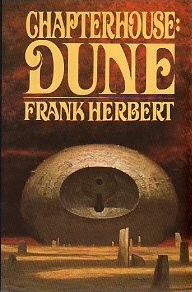 Two decades after Frank Herbert's death, his son Brian Herbert, along with Kevin J. Anderson, published two sequels – Hunters of Dune (2006) and Sandworms of Dune (2007) – based on notes left behind by Frank Herbert for what he referred to as Dune 7, his own planned seventh novel in the Dune series. ^ a b "Best Sellers". The New York Times. NYTimes.com. May 19, 1985. Retrieved July 20, 2011. ^ Clute, John; Nicholls, Peter (1999). "Exhibitions – Science Fiction Hall of Fame – Frank Herbert". The Encyclopedia of Science Fiction. Orbit Books. Archived from the original on July 22, 2012. Retrieved April 14, 2018 – via empmuseum.org. ^ Snider, John C. (August 2007). "Audiobook Review: Sandworms of Dune by Brian Herbert & Kevin J Anderson". SciFiDimensions.com (Internet Archive). Archived from the original on May 13, 2008. Retrieved July 20, 2011. ^ Jonas, Gerald (June 16, 1985). "Science Fiction (Review)". The New York Times. NYTimes.com. Retrieved July 20, 2011.